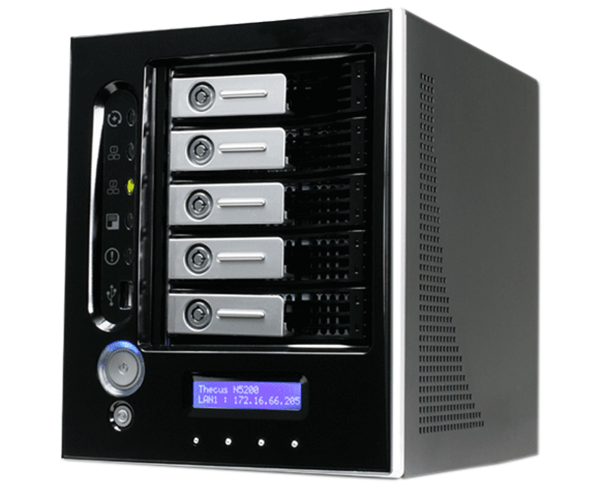 Five-bay hot swappable network attached storage. Processor for storage computing with 30% energy saving. RAID 0, 1, 5, 6, 10 and JBOD support. Built-in 4 port Gigabit switch with IP sharing (N5200 RouStorTM). 802.3ad based load balancing and failover (N5200). 6/30/2006 – Since its introduction, the 4-bay N4100 NAS device from Thecus has been winning numerous recommendations from such renowned media as Hardware Zone, Hexus, and Tom's Hardware Guide. Today, Thecus Technology, a leading provider of digital storage solutions, is proud to launch its RouStor™ series. Thecus' RouStor™ series combines Thecus' award-winning NAS technology with routing capabilities into a single device. The result is an all-in-one solution that handles both networking and network storage for the home or office. Despite its small 230mm x 190mm x 230mm dimensions, the N5200 packs a lot of punch. Under the hood lies an Intel® Celeron® M processor running at 600MHz and 256MB of DDR memory for powerful data-processing capabilities. The N5200 has the capacity for five 3.5" SATA hard disks for over 3TB of storage! 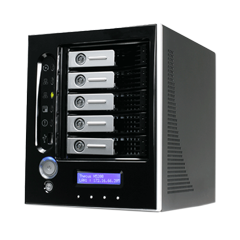 To keep data secure, the N5200 features various RAID modes, including RAID 0, 1, 5, 6, 10 and JBOD. Managing your RAID array is easy with the N5200's built-in RAID management features, including auto rebuild, hot swap, hot spare, disk roaming, and more. To backup your data, the N5200 comes with the Thecus Backup Application, as well as a feature called Nsync. With Nsync, users can have the N5200 automatically upload files to an external storage device via FTP at a designated time. What's more, if the external device is another N5200, the connection is made via a secure connection. Designed for SMBs to enhance data security, Nsync takes the guesswork out of data backup. With an intuitive multilingual web-based interface and Windows, Apple OS X, and Linux compatibility, file sharing between networked PCs with the N5200 is more convenient than ever. A speedy eSATA connector is included for future external expansion possibilities. Part of Thecus' innovative RouStor™ series, the N5200 includes 3 USB ports, a Gigabit Ethernet port, and a 4-port Gigabit switch for excellent connectivity options. Users can even install a USB 802.11 b/g dongle for Wi-Fi capability. In addition, the N5200 comes with a robust software suite, including a print server, and FTP server, WebDisk capability, and Windows Active Directory support.